There are thirteen glaciers on Kilimanjaro. Two larger glaciers that extend up to the summit crater and rim are the Furtwängler and Rebmann Glacier. Walter Furtwängler was 4th European to reach the summit in 1912. Johannes Rebmann was a missionary who found and reported Kilimanjaro in 1849. At the time scientists dismissed, as fiction, his stories of a glaciated peak in Africa. Claus von der Decken travelled to Africa in 1861 and confirmed Rebmann's sightings. He also got a glacier named after him, in fact the one next to Rebmann's. The Furtwängler is the glacier (now actually two ice masses after it split in two during the last decade) sits on the crater floor, about 900 feet below and to the north of Uhuru Peak. It has been studied extensively and is known to have lost over 65% of it's mass between 1975 and 2010. 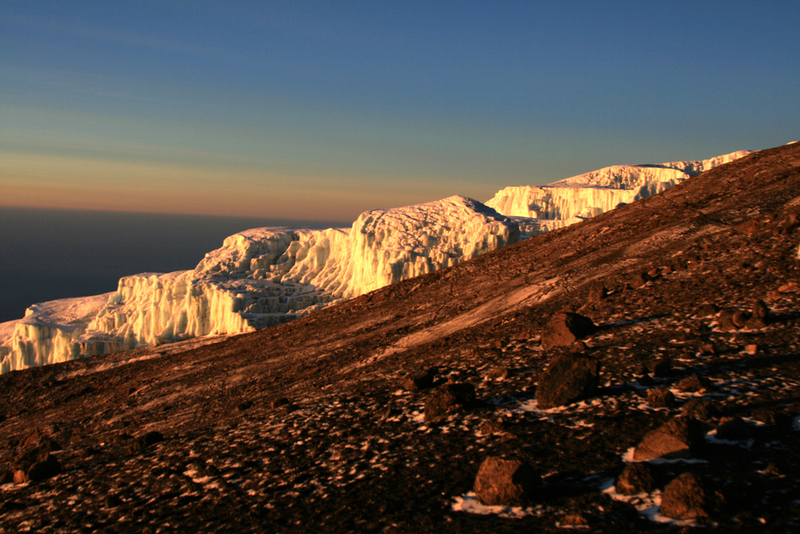 Examination of core samples of Kilimanjaro's Glaciers suggest they are 11,700 years old. Various scientific reports suggest that ALL of the glaciers will be gone by a date between 2022 and 2033. This will mark the end of the glaciated era in African continent. The southern ice field glaciers that we see from the Machame Route are (left to right), Diamond, Balletto, Heim, Kersten, Decken and Rebmann. The full list - Arrow Glacier, Balletto Glacier, Barranco Glacier, Credner Glacier, Decken Glacier, Diamond Glacier, Drygalski Glacier, Eastern Ice Field, Furtwängler Glacier, Heim Glacier, Kersten Glacier, Ratzel Glacier, Rebmann Glacier. Here is a map of the glaciers and some pictures from previous expeditions.